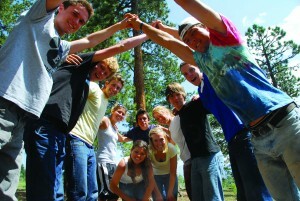 Support from her classmates and class leaders help an NLC teen overcome panic during a steep climb. Before she joined the 2020T class in DiscoveryBound’s National Leadership Council (NLC), Lauren didn’t know what servant leadership meant. She hadn’t been away from the comforts of home, and her daily activities didn’t include reading the Christian Science Bible Lesson. Life was fine – but Lauren was looking for something to help her get closer to God. Where did this come from? Lauren points to the two weeks she spent at the A/U Ranches as a rising ninth-grader during her class’s orientation summer. During Lauren’s second summer with her NLC class, she found another opportunity to dig deeper. 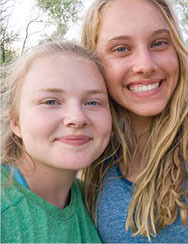 Along with her two class leaders, six professional guides and a Christian Science practitioner, Lauren and her classmates took a two-week trip rafting and kayaking on the Green River in Utah – their NLC adventure trip. They found a safe place to sit, which helped, but only if she didn’t look off the edge. “While I was sitting there, I was reminded of FEAR as an acronym: false evidence appearing real,” Lauren says. “But the view at the top and the love that I would feel when everyone at the top saw me – those things were real.